Bighorn Sheep or Mountain Goat? Want to see some bighorn sheep? In Dubois, WY, we are privileged to have one of the world’s largest wintering herds of Rocky Mountain Bighorn Sheep right out our back door! The Center offers guided viewing tours from November through March to see the bighorns during specially-scheduled guided tours with experienced Center staff and volunteer guides. 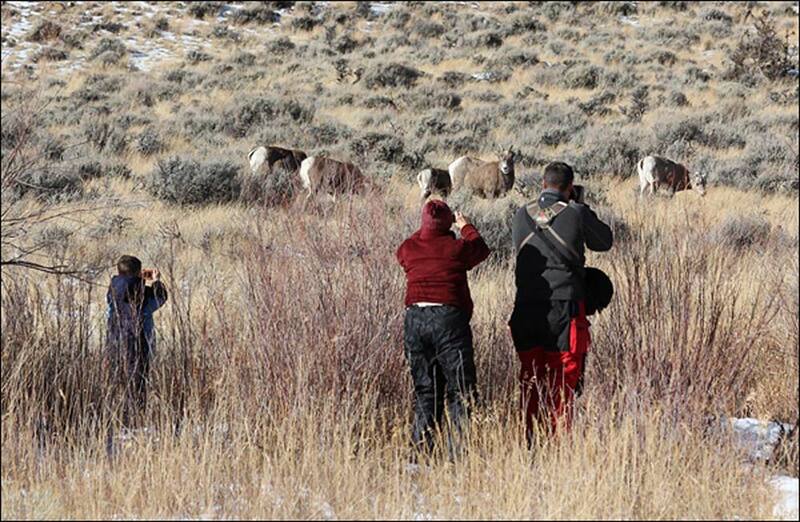 Join a guided three to four hour field tour to experience bighorn sheep in their winter range. This customized tour is perfect for wildlife enthusiasts, photographers and small groups. We begin the tour at the National Bighorn Sheep Center, providing a thorough background introduction to the Whiskey Basin Wildlife Habitat Management Area, bighorn sheep biology and the history of wild sheep. We then drive to specific locations where bighorn sheep have been recently sighted and learn more about their habitat and biology in the field. Optional hiking is available to additional sites. We provide binoculars, transportation and knowledgeable guides, and we can also arrange for bag lunches if desired. Please call us today at 307-455-3429 to reserve your tour. We require a deposit and at least 48-hour advance notice. The tours costs $100/person (for two or more), or if desired, one person can attend for $200. We can also accommodate larger groups at reduced rates, so please contact us for more information. Our weather can change suddenly, so dress in layers for your tour of the Whiskey Basin Wildlife Habitat Area – and don’t forget your binoculars. To begin, turn south off of Highway 26/287 onto the Trail Lake Road (Forest Road #411), located about 4.5 miles east of the Bighorn Sheep Center in Dubois. Look for the brown and white sign marking National Forest Road #411, the Dubois Fish Hatchery and the Whiskey Basin Wildlife Habitat Area. Just off of the highway, the road splits. Stay on the left fork of the road. Your tour begins at the wildlife viewing kiosk two miles up Trail Lake Road. Click HERE to view printable PDF Self-guided wildlife tour map of the bighorn sheep winter range. Because the stops below aren’t marked, we’ve identified each by its distance from the kiosk. Remember to set your trip odometer before you leave the kiosk! Stop just before the cattle guard at the top of the rise. Ahead and to your right, on the smooth, treeless north-facing slope, you may be able to pick out bighorns, elk and mule deer with your binoculars. The road now begins to drop into Torrey Valley, carved by glaciers that ground their way out of the Wind River Range as recently as 10,000 years ago. Glacier-fed Torrey Creek tumbles out of the mountains and feeds the valley’s chain of three lakes – Torrey, Ring and Trail – which formed behind natural rock dams left by glaciers. On the left you’ll glimpse two shallow lakes, frequented by waterfowl (including trumpeter swans) in the migration seasons, then Torrey Lake, largest and deepest of the chain. Ring Lake comes next. At the far end of Ring Lake you’ll find public restrooms and a picnic area. As you pass these lakes, watch for osprey – large brown and white hawk-like birds that plunge into the water feet-first to catch fish. There is an osprey nest near the head of Torrey Lake, but it’s on private land, so please do NOT stop, park or get out of your vehicle to observe it. There should be an exposed bank of dirt on your right. Stop and look carefully along it for sheep tracks and tooth marks. This is a natural mineral lick where bighorns often gather in winter. If you see sheep at the lick, please stop, stay in your vehicle and wait for them to move away before continuing. This is a good place to look at Torrey Creek, whose willow-lined banks provide food and shelter for moose. If you’re lucky (especially at dawn and dusk) you may see a beaver or hear one slap its tail on the water. Have you spotted a raven flying over yet? Ravens, large black soaring birds, are in the same family as magpies, common black & white birds with very long tails. Both species like to eat carrion and are year-round residents of the area. A mile further up the road is the Trail Lake Ranch / Whiskey Mountain Wildlife Conservation Camp. Bear to the right, around it – and watch for sheep in the road! Along Torrey Creek, to your left, you can see old beaver dams and lodges. In winter, look for sheep on the skyline of Torrey Rim to the right and the slopes below it. As you approach the trailhead and turn-around, stay to the right. At the turn-around, you’ll find restrooms, an information kiosk and the start of the Glacier Trail into the Fitzpatrick Wilderness. 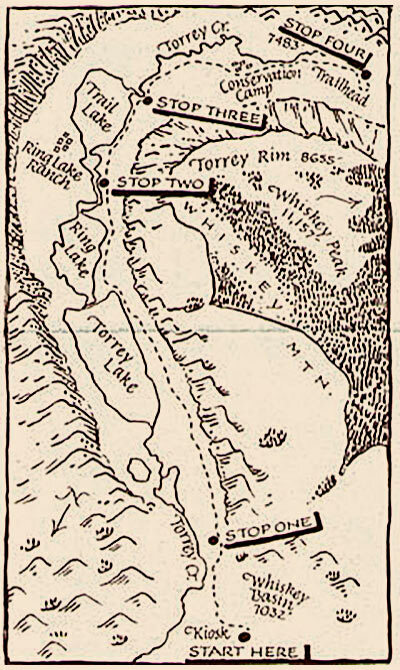 This is the most popular route to Gannett Peak, Wyoming’s highest at 13,804′. Look for sheep at the crest of Torrey Rim to your right, and golden eagles (quite a bit bigger than ravens) soaring above it. The dark rocks that block the valley ahead are ancient granite, billions of years older than the rock you see on Torrey Rim. If the light is right, you might be able to see the wet-looking shine of “glacier polish”. This granite is so hard that the glaciers could not remove it, but instead gouged grooves across it, or smoothed it to a high gloss. If you’re dressed for a hike and have another hour to spare, walk up the Glacier Trail for a half-mile to a footbridge that passes over a rocky gorge and a series of thundering waterfalls. Just before the bridge, the trail to Lake Louise forks to the right. A two-hour hike will take you to this picture-perfect alpine lake surrounded by soaring peaks. We hope you’ve enjoyed your tour of this spectacular valley and the bighorns’ winter range. To learn more about wild sheep, visit the National Bighorn Sheep Interpretive Center in downtown Dubois, or call the Center at (307) 455-3429 for more information. Wondering what the weather might be? For a local weather forecast, click HERE. For a local road conditions report, click HERE. We inspire, educate and conserve through our exhibits, programs and outreach with a commitment to wild sheep since 1993.